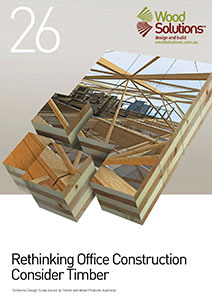 These Guides provide an introduction and overview of a research project that developed designs for four building types with timber solutions, as well as alternative designs with conventional steel portal or concrete construction. The project aimed to provide a source of timber costing information to building professionals by comparing the cost of timber commercial buildings to the cost of those constructed using traditional materials. The timber solutions were designed to optimise functional performance, constructability and cost effectiveness and provide guidance for compliance under the National Construction Code (NCC). • A single-storey industrial shed. Each solution was designed and then independently costed for a timber option as well as a more conventional concrete-framed or steel-framed solution. The cost plans were based on a reference location in suburban Sydney. The site was assumed to have no significant cost implications concerning site access, ground conditions or neighbouring properties. 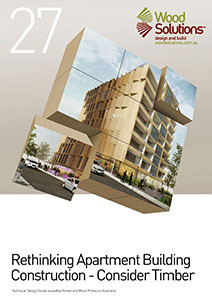 This Guide provides an introduction and overview of a research project that developed designs for four building types with timber solutions, as well as alternative designs with conventional steel portal or concrete construction. 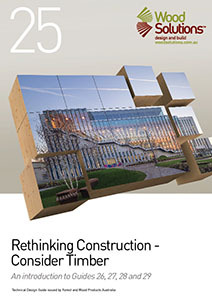 The Guide is based on a research project that developed a model mid-rise office building and a corresponding timber solution, and compared it with conventional concrete construction. The timber solution was designed to optimise functional performance, constructability and cost effectiveness and provide guidance for compliance under the National Construction Code (NCC) for Class 5 office buildings. 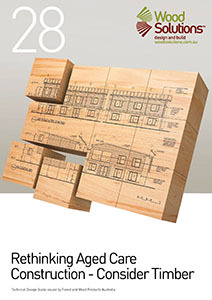 This Guide provides an explanatory understanding of decision making issues when developing timber solutions. The Guide is based on a research project that developed a model apartment building and a corresponding timber solution, and compared it with conventional concrete construction. The timber solution was designed to optimise functional performance, constructability and cost effectiveness and provides guidance for compliance under the National Construction Code (NCC). Savings also existed in the preliminary costs for the project, craneage and footings, areas not recognised when comparing costs. This Guide aims to help those involved in the decision chain (such as cost managers, estimators, design professionals, building developers and project managers) gain a better understanding of the value that timber construction systems offer aged care accommodation projects. The timber solution shows costs that are $112,600 (16%) lower than a comparable steel frame solution. 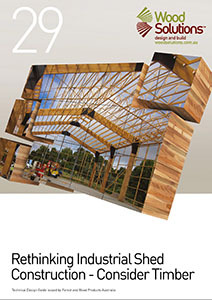 This Guide aims to help those involved in the decision chain (such as cost managers, estimators, design professionals, building developers and project managers) gain a better understanding of the value that timber construction systems offer industrial shed projects. The timber solution with 10.0 m portal spacing was by far the cheapest of the three options considered (9.4% cheaper than steel), followed by the timber solution with the 6.67 m portal spacing (5.0% cheaper than steel).